It may not be Camilla's choice for investing in property but Prince Charles nevertheless seems set on buying a house in Romania's Transylvania. 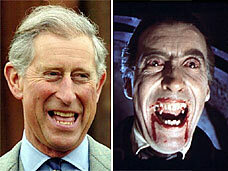 The choice of Transylvania could be seen as particularly appropriate given that the Prince is reportedly related to the blood-drinking Dracula who once inhabited the region. It is believed that Queen Mary, consort of George V, was related to the 15th Century slayer prince Vlad the Impaler who inspired Bram Stoker's Dracula. And it is known that porphyria, an iron deficiency, which is thought to lie behind the vampire myth, has run in the Royal Family. But Camilla need not worry. Charles has no plans to leave Highgrove. The Prince is apparently looking to buy a property to promote sustainable tourism in the region, a Clarence House spokesman confirmed yesterday. The proposed purchase - in the village of Viscri - would not be for Charles' personal use, but would be restored and rented out to tourists. The Prince is patron of the Mihai Eminescu Trust, which works to restore the cultural heritage, economy and nature of Transylvania's Saxon villages and their surroundings. The village where Charles plans to buy a property is also the headquarters of the trust. In addition to restoring some 180 medieval houses and several churches, the charity has supported traditional rural technologies, such as the construction of wood-fired kilns for handmade bricks and tiles and organic farming. Charles spent two nights in Viscri on his last visit to the areas in May this year, touring the charity's restoration work there. Viscri has been part a world heritage site since 1999 and people living there are not even allowed to paint their homes without approval from the Culture Ministry. Charles has visited and even stayed in the Saxon villages a number of times in the last few years even though it has few facilities. It is very badly connected to the outside world, there are few cars, very few phone lines and little electricity. The population includes 130 Romanians and 400 gypsies, the latter who moved into the village in 1980 when the Germans started to leave and abandoned their homes. A house in the Viscri village would cost about £4,000. The Prince's alleged relative Vlad is said to have dispatched more than 100,000 Turkish warriors in battle. The vampire legend was fed by Vlad's own predilection for eating bread dipped in his victim's blood. But it wasn't until an author of the Victorian period, Bram Stoker, became interested in the myth of Vlad the Impaler, that Count Dracula was born. Dracula means "son of the devil" in Romanian. Dracula means "son of the devil"? Or does it mean Dragon like "Order of the Dragon"?